The War on Drugs got it wrong. When President Nixon launched the “War on Drugs” in 1971, he framed the way we would view drug epidemics moving forward: as a moral issue. The “war” cast people struggling with addiction as criminals and degenerates to be dealt with by the criminal justice system. But law enforcement solutions have failed to curb addiction, and have further contributed to harming communities already experiencing deep levels of trauma, particularly communities of color. Criminal justice approaches, which often tear communities apart rather than strengthening them, are not the key element to solve this far-reaching epidemic, and punishing people suffering from addiction is counterproductive. As our understanding of addiction changes, we must address the underlying causes. The current opioid epidemic has helped to alter the “face” of addiction — with the focus now on white, rural America — and with this change the popular understanding of addiction is beginning to shift from one of intolerance and stigma to empathy and action. The idea that addiction is not a moral failing (as it was portrayed during the crack epidemic that plagued urban communities), but rather the result of underlying structural drivers that must be addressed, is starting to take root and shape policy. We can prevent community trauma if we know what to protect against. Years of over-prescribing opioids and declining conditions in communities suffering from loss of industry and social upheaval has created a perfect storm for opioid misuse and, sadly, overdose deaths, which have been increasing year after year. In Ohio alone, from 2013 to 2015, unintentional overdose deaths climbed from 84 in 2013 to 1,155 in 2015. In 2016, 11 people in that state died each day from opioid misuse. County health departments and the behavioral health sector have long worked on opioid misuse, but have often fallen short because their efforts almost exclusively focus on treatment, without addressing the underlying root causes of the epidemic. Criminal justice approaches, which often tear communities apart rather than strengthening them, are not the key element to solve this far-reaching epidemic, and punishing people suffering from addiction is counterproductive. The factors driving addiction overlap with factors driving community trauma. Loss of industry and living wage jobs – Loss of industry in rural areas has resulted from trade policies and other economic trends that have led many US manufacturing jobs to relocate overseas. Agricultural policies favor large agribusinesses, and have forced local and small family farms out of business. As a result, unemployment is high, health has declined, and communities are struggling economically. Lack of economic opportunity and a pervasive sense of hopelessness – The economic decline in many rural areas means there are fewer opportunities for residents to obtain living-wage jobs and meet their basic household needs. Beyond that, these communities often lag behind in economic investment, which creates limited stable affordable housing, and fewer recreational opportunities, educational opportunities, and opportunities for artistic and cultural expression. Broken relationships and frayed social connection – When economic and social opportunities disappear, often community members who can afford to relocate will move out of the area. This means that family and social support networks deteriorate, and those who remain can’t necessarily provide social support to others. Compounding the problem is the fact that the exodus of more affluent community members draws resources away from communities, contributing to a lack of public funding to build and maintain safe and welcoming public spaces. Norms that keep the problem hidden from view – In many rural communities, people identify strongly with the idea of being “independent,” which can make people hesitant to seek help. In addition, because there is a shared understanding that substance misuse is a private issue, it’s more difficult for people to let others know about challenges they or their families face. Finally, in some communities, the opioid epidemic is so advanced that intergenerational use of opioids has become the norm. Lack of access to care – Communities depend on state and federal funding for mental health services. State funding for local mental health facilities and services varies widely, and rural communities, which often have smaller tax bases, struggle to fund public health and prevention programs that address substance misuse. Exacerbating the issue is the lack of clinical professionals, and limited access to healthcare services available in rural communities. Prevention Institute’s approach to opioid misuse acknowledges that communities, not just individuals, have experienced trauma — and that addressing the sources of trauma is essential in any response to the opioid epidemic. Growing strong and resilient communities will also require more attention on preventing future addiction before it occurs. Last year, through the 21st Century Cures Act, Ohio received substantial funding to address the opioid epidemic, with a portion of that being directed to assisting 12 prioritized counties developing prevention plans. The Ohio Department of Mental Health and Addiction Services is working with the 12 counties to broaden their efforts and take a closer look at community conditions and the systems that have a role to play in finding multi-sector solutions. Through a prevention and public health approach, which acknowledges and addresses community trauma whilst considering the elements in the community environment that are drivers of the epidemic, Ohio and other states disproportionately impacted by OUD and overdose deaths can get ahead of the opioid epidemic. Featured image credit: “Despair” by David DeHetre. CC BY 2.0 via Flickr. Larry Cohen is founder and executive director of Prevention Institute. A leading authority in developing practical prevention strategies for communities, Cohen's work includes catalyzing the nation's first multi-city no-smoking laws; helping define violence as a public health issue and working with the UNITY City Network to prevent violence; advancing chronic disease prevention through physical activity and healthy eating; and promoting better understanding of the underlying causes of illness, injury, and health inequities. His work has been recognized by the US Department of Health and Human Services, American Cancer Society, Centers for Disease Control and Prevention, American Public Health Association, and Society for Public Health Education. He lives in Oakland, California. 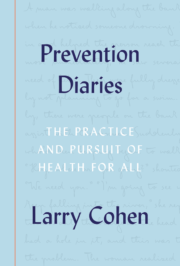 He is also the author of Prevention Diaries: The Practice and Pursuit of Health for All, available in print and online from Oxford University Press. What about parenting? Most kids raised by parents who engage in supportive parenting behaviors and practices don’t harm themselves and others. This article is an example of “social perspective change literature” that is designed to misdirect the focus of solution approaches grounded in a posteriroi knowledge to solution approaches that ignore all that has been learned in the past. More important this troll piece ignores the fact that its members of the white community who maintain the system of illegal drug production, distribution, finance, and preservation. Even the U.S. government has participated in the drug trade, not to mention American banks as money launderers. The one other comment to this tripe points directly to one of the foundations of drug abuse sustainability; the American system of enculturation. Drug abuse finds its roots in the orientations and habit structures instilled in the nations children. Emery C Graham Jr, all you post is just an opinion of your own. If you expect people to believe what you say citing facts will go a long way. Other than that your opinion is not credible enough to believe. Sorry!